By Kori ~ July 2nd, 2012. Weâ€™ve had our eyes on Robert Ramsay Cellars for quite some time now and have declared it a â€œWinery to Watchâ€ in the past. With the current releases, Robert Ramsay continues to impress. Robert Ramsay Cellars, located in Woodinville, Washington, is named for winemaker Bob Harris’s great uncle Mason Ramsay. When asked about the name, he jokes that “Bob Harris Winery” just didn’t have the same ring to it. Harris works in the software industry by day and devotes the rest of his time to producing high-quality Syrah, Cabernet Sauvignon, Mourvedre, red blends, and RosÃ©. In 2001, he decided to take his winemaking hobby to the next level and got his start at Coeur d’Alene Cellars. Now his efforts are focused on his Robert Ramsay Cellars in Woodinville’s warehouse district. We recently had the opportunity to taste five current releases from Robert Ramsay in a blind samples tasting. All five wines were very good, but we were especially impressed with the 2009 McKinley Springs Syrah and the 2011 RosÃ©. They are both outstanding! At $25, the McKinley Springs Syrah also delivers serious bang for your buck. And, while itâ€™s still early in the season, the Robert Ramsay RosÃ© has quickly become our go to RosÃ© for the summer of 2012. If you live in the greater Seattle area or will be visiting this summer, an outing to the wineries in Woodinville is well worth your time. And while you are there, I highly encourage you to visit Robert Ramsay Cellars. 2009 Robert Ramsay McKinley Springs Syrah (McKinley Springs Vineyard, Horse Heaven Hills, Washington): 92% Syrah, 5% Viognier, and 3% Mourvedre. Dark, inky purple-black. Very aromatic with earth, blackberry, and black pepper on both the nose and palate. Full-bodied with lively acidity and high tannins. Well-balanced with good complexity and a very long finish. 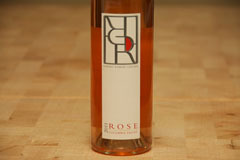 2011 Robert Ramsay RosÃ© (Columbia Valley, Washington): 62% Grenache, 19% Cinsault, 18% Syrah, and 1% Viognier. Pale pinkish salmon in color. Very aromatic with watermelon, raspberry, and cherry on both the nose and palate. Dry and medium-bodied with crisp acidity. Well-balanced with a very long, refreshing finish. A fabulous summer sipper and excellent with food. 2009 Robert Ramsay McKinley Springs Mourvedre (McKinley Springs Vineyard, Horse Heaven Hills, Washington): 100% Mourvedre. Dark red in color. Aromatic with game, earth, and black fruit on the nose. More game, earth, black fruit, and a touch of smoke come through on the palate. Medium to full-bodied with crisp acidity and medium to high tannins. Well-balanced and smooth with a long, lingering finish. 2009 Robert Ramsay Masonâ€™s Red (Columbia Valley, Washington): 87% Syrah, 4% Cabernet Sauvignon, 4% Mourvedre, and 5% Viognier. Dark purple. Aromatic with oak and floral notes on the nose. Black cherry, blackberry, and spice come through on the palate. Medium to full-bodied with crisp acidity and a long, smooth finish. 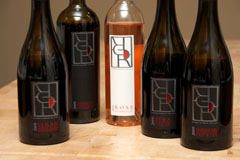 2009 Robert Ramsay Boushey Syrah (Boushey Vineyards, Yakima Valley, Washington): 95% Syrah and 5% Viognier. Deep purplish red. Nice nose with black fruit and raisin aromas. More raisins as well as black cherry and spice come through on the palate. Medium to full-bodied with lively acidity, medium tannins, and a long finish.